438 in stock Need More ? Double bill featuring two popular animated movies. In '101 Dalmations' (1961) when Roger and Anita marry and their dogs Pongo and Perdita produce a litter of 15 dalmation puppies, they find themselves receiving unwelcome advances from the evil Cruella de Ville. She has plans to turn the pups into a fur coat and when Roger and Anita refuse, she hires two comedy crooks to steal them for her. Once the theft is revealed, Pongo rallies together a gang of canine friends and sets out on a mission to retrieve his young, discovering them in a lonely mansion, imprisoned along with a further 84 dalmation puppies. 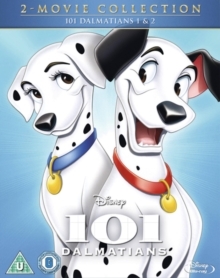 '101 Dalmations 2: Patch's London Adventure' (2001) is the sequel to the Disney animated classic about a huge litter of dalmation puppies and their adventures in London town. When young Patch accidentally becomes separated from his siblings, he takes the opportunity to strike out on his own and meet his canine hero Thunderbolt, whose TV adventure show is currently shooting nearby. The young pup can't believe his luck when he gets the chance to serve as Thunderbolt's real-life sidekick in a series of adventures around the city; and when Cruella de Ville kidnaps all of Patch's brothers and sisters, the two new friends realise that it is up to them to save the day.